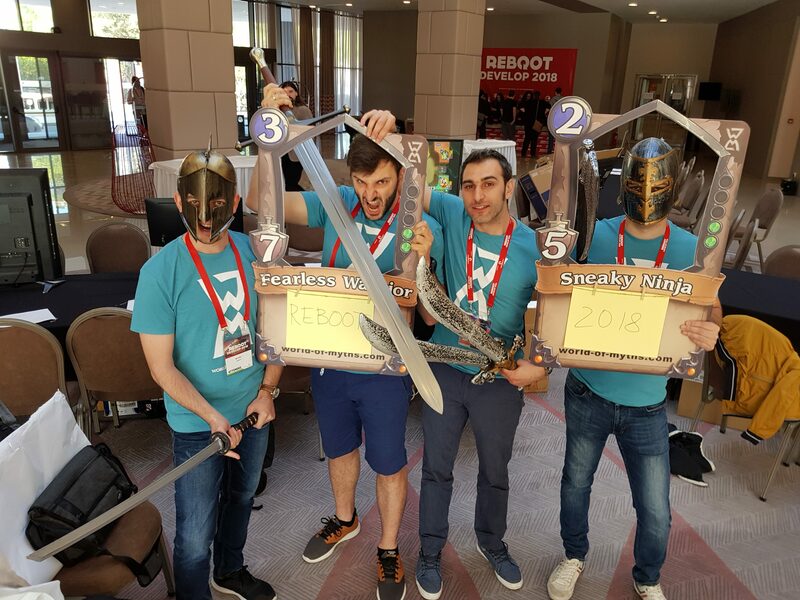 We were really excited to attend our first fully games related event Reboot Develop 2018, Dubrovnik. We’ve met some great people who gave us amazing feedback. We had 4 people attending the event – me(Pavel), Svetlio, Radi and Minko. I drove with Minko for 14 hours from Sofia to Dubrovnik while Radi and Svetlio flew there. Someone had to drive because we couldn’t fit all the computers and marketing materials on a plane or at least it would have been expensive. We were going to join the Indie Expo Area and show World of Myths. We had to be quite creative with the ads exposure as no roll-up banners were allowed. So we decided to print out huge cards from World of Myths so they can be used as photo frames. We bought some plastic swords, helmets and axes with the idea of making people take a picture as a card from our game. We even managed to find a solution for custom card text for each photo. And because this was not enough I brought a real sized replica of Ned Stark’s sword – Ice (Game of Thrones). With it’s 150 cm height and 8kg weight we thought that it will catch an eye or two. There was the problem with crossing multiple non-EU country borders with the sword but we managed to find the certificate and prove that it is not stolen from a museum or something like that. 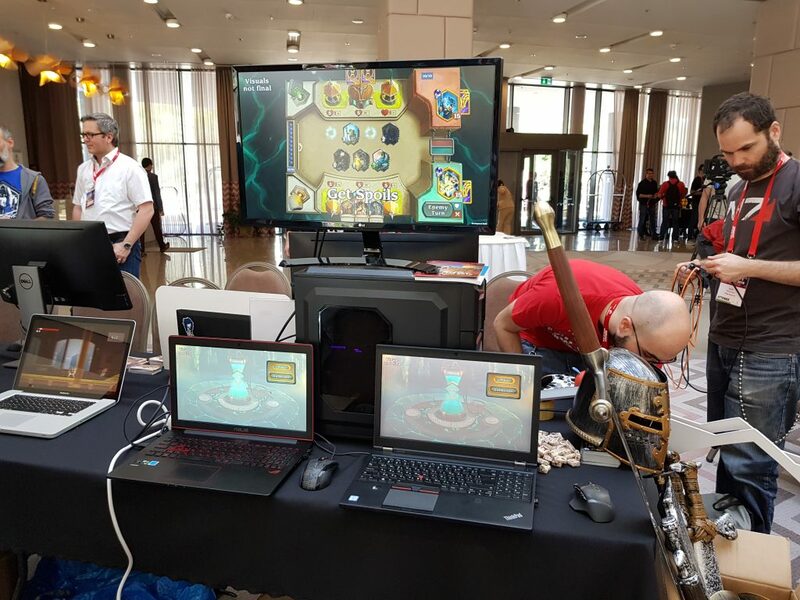 We had a limited space at the Indie Expo which we knew would have been completely filled with the 2 laptops that were required to play World of Myths. There was no place for banners or something like that. However we brought a PC with a monitor then used the PC as a stand and placed the monitor on top of it and all that was behind the 2 laptops. We played our trailer on repeat on that screen and that created some kind of advertising. We also brought some sweets from Bulgaria but I guess this is now a common thing among the Indie Expos and almost noone tried them out. When I was available I used to put on one of the helmets and one of the cards with text “Come meet us”, then got the big sword swinging through the crowd and that attracted some attention to us. The idea of making people taking photos with the cards frames and then sharing those on the social networks didn’t really pick up so we abandoned it after the first day. Lesson learned – most of the people on such event are there to network and learn and not so much to attend raffles. 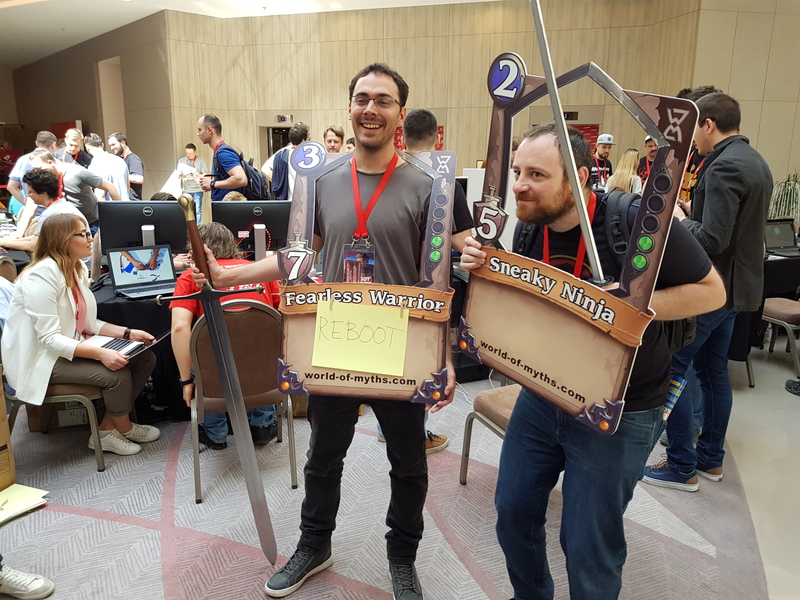 We had it all planned and everyone knew their role – Minko was staying on the boot, Svetlio attending targeted talks and Radi and I doing the networking. Our main goal during the event was to validate our product with renowned people from the industry and we are pretty happy with the response. We are now more confident that we truly have something special as a game. We need to execute it right though. We almost got no negative feedback which got us pleasantly surprised but we are already thinking on how to improve on the one we got. About 1500 participants attended Reboot Develop 2018. The conference kicked off with symphony orchestra playing various Star Wars soundtracks. Then after a really short keynote, Serious Sam 4 was announced which I think was the biggest announcement for the whole event. It was also announced that next year Reboot Develop will have its event in Canada as well. There were more than 100 speakers delivering their presentations on 7 stages, two of which were outside with beach and mountain views. We can’t talk about all those amazing presentations but the ones that we really learned from were the 2 presentations of Jason Della Rocca (Solving the Funding Sources and Timing Puzzle; Perfecting Your Pitch) and Ziva Cizman’s “Beyond classical Paid UA”. It is hard to tell how many Indie teams were showcasing because we were in separate rooms and I didn’t manage to count them when I had the chance but the number was something between 30 and 50. There were some really cool looking titles but we didn’t get to test almost any of them as we were quite busy. There were 2 parties at night. The first one was organized by Outfit7 and was at the outdoor swimming pool. The second day party was organized by Unity and was on the beach. Each attendee got free pass and 2 free drinks for the parties. Indie Awards were announced during the closing ceremony. The judging process was anonymous and the judges were secretly walking around, testing games without introducing themselves as judges. We didn’t fit any of the categories so it was no surprise that we didn’t win any award. Nordic Game Discovery Contest winners and Pitching sessions winners were announced as well. With that the conference was over and it was time to head back home for another 14 hours drive. We really hope to have the chance to attend Reboot Develop next year. You can check out some of the footage we took during the three days in the video below. Next stop: Casual Connect London.